Take Mesogion Avenue north & keep straight on this road all the way (it passes through Ag. Paraskevi & the through the underpass at the Stavros junction). 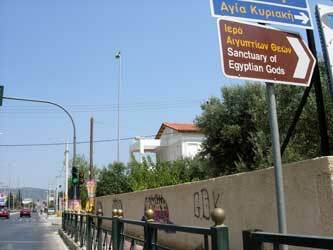 The road has now continues as the dual-carriageway Marathonas Avenue (the Olympic Marathon road). Continue straight on Marathonas Avenue through Peania, and then past the Rafina junction. 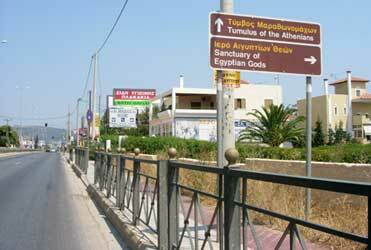 Marathonas Avenue soon passes through the coastal town of Nea Makri on it's way to the town of Marathon. On exiting Nea Makri town centre note a junction to the left for Dionysos & Pendeli as you pass by. Drive over Pendeli mountain from either Old Pendeli (via Halandri - Vrilissia on Pendelis Avenue) or from Ekali (taking the mountain road through Dionysos to Nea Makri). Pass the Panorama taverna on the right on the way. Continue down the mountain (observe the sea view & Nea Makri below) until you reach the traffic-light "T" junction at Marathonos Avenue. Turn left onto Marathonos Avenue in the direction of Marathon. After passing a traffic light note a sign pointing to the Sanctuary. Ignore this turning and continue to the second sign for the sanctuary at a traffic light (there is also a sign for Ag. Kiriaki church here). 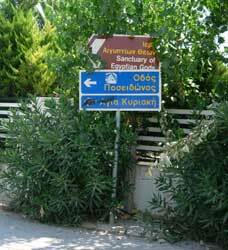 Take a right turn here (onto Kefallinias Street) and follow the signs to the Sanctuary. You will probably need to park as the Sanctuary is contained inside the perimeter of what used to be an American base & the perimeter fence gate is usually locked). Walk the short distance to the sea front and turn left and walk towards the Ag. Kiriaki church. Before reaching the church notice a break in the fence on the left. Walk through here and the Sanctuary is on the right. You will need to walk along the perimeter (note remains of ancient wall projecting up through a stream) and turn right to observe the entrance gate. The sanctuary is located immediately behind the Ag. Kiriaki church on the seafront. 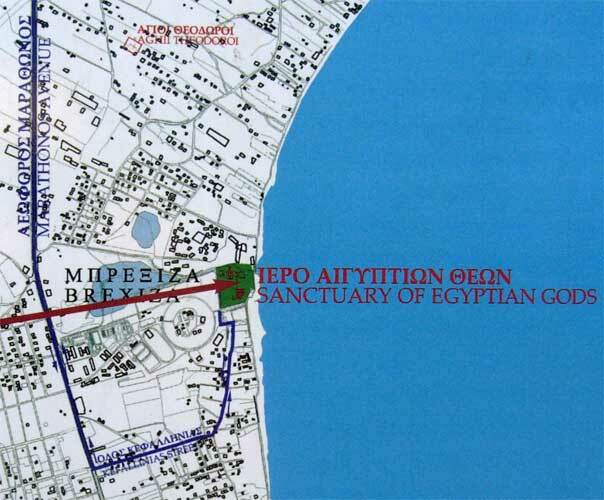 The sanctuary is enclosed in a high wire fence & the gate has been padlocked since showcase excavations ceased after a brief opening to the public during the Athens Olympic Games in August 2004. Sporadic excavation work appears to be continuing. First signpost on Marathonas Ave.
Second signpost on Marathonas Ave. The third & last signpost for the Sanctuary. (OR, alternatively if you want to visit a beautiful (European Blue Flag) beach with mowed green grass to lie on & palm trees for shade, turn right immediately after this sign, then at the bottom of the road turn right & immediate left and follow road to the beach). There are two snack bars with tables, showers and also lifeguards + portable toilets (in the summer months).